Christmas in Cape Town means perfect weather, good company, and lasting memories, but with all the planning involved it can be more frantic than fun. 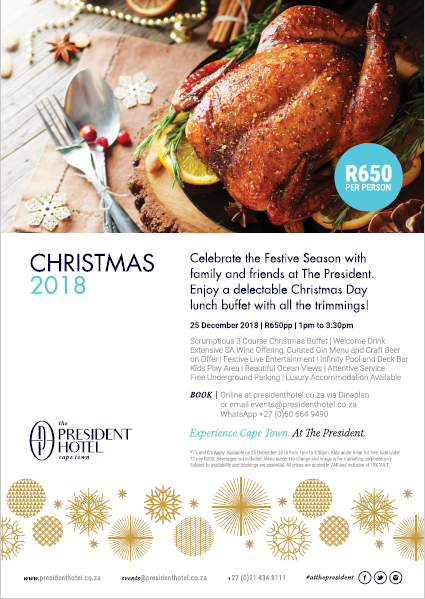 To ensure both locals and visitors celebrate the best of the holiday; the President Hotel, set on the shores of the Atlantic Ocean, will be serving up a buffet style feast and a festive atmosphere on 25 December with dishes no one in the family will be able to resist. 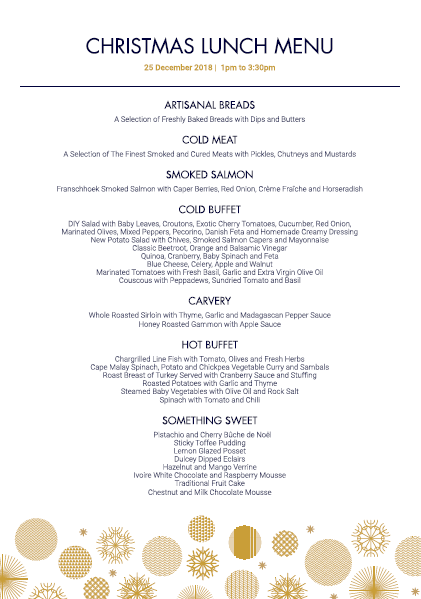 From 13:00 – 15:30, guests will be welcomed with a complimentary drink and live entertainment as they tuck into a scrumptious three course menu of which can be paired with a glass of notable South African wine, curated gin or a local favourite craft beer. The buffet boasts the chef’s most decadent creations with Franschhoek smoked salmon with caper berries, red onion, crème fraîche and horseradish, a selection of carvery including honey roasted gammon with apple sauce, heavenly cold and hot buffets, and sweet delights such as pistachio and cherry Bûche de Noël, all priced at R650 per person. Wine, gin, and beer are not included. Children under 6 eat free, kids under 12 pay R200. With dedicated kids’ activities and play areas, parents can enjoy some much-needed leisure time around the sun-drenched pool deck while the little ones are entertained at the hotel playground under the watchful eye of a dedicated child minding team. Booking is essential. To make a reservation email [email protected] or call +27 (0)21 434 8111, or to find out more about the President Hotel follow them on their social media channels via Twitter, @ThePresidentCT | Instagram, @thepresidentct | Facebook, facebook.com/PresidentHotelCapeTown.